ANDRITZ pulp baling technology ensures high performance and safe operation of market pulp sheet drying plants. 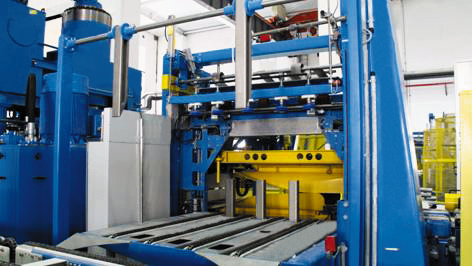 The lines are fully automated, controlled by the ANDRITZ BaleMatic pulp finishing control system. Various conveyors of stationary, swing, turntable, transfer, or intersecting type are available to adapt to conditions in the customer’s plant. The conveyors are modular to minimize spare parts storage requirements. They can be equipped with carbon steel or stainless steel chains (maximum cleanliness). Installation of a weight scale is typical in a modern baling line. The weight of each bale is displayed locally and transmitted to the control system, which prints the specific weight on each bale. 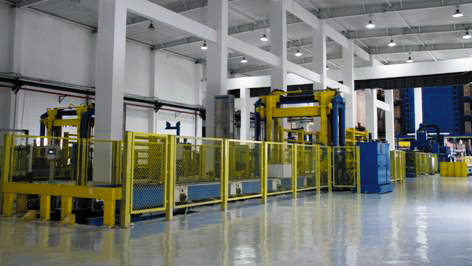 ANDRITZ supplies high-speed presses with a pressing capacity of 1,200 t and a cycle time of less than 15 seconds. This permits a throughput of up to 300 bales per hour. The press can be adjusted to achieve either a specified bale height or density. The hydraulics are equipped with power control management. The Duowrap applies a top and a bottom wrapper sheet to the pressed pulp bale. Wrapper sheets are cut in the cutter-layboy, stored on the wrapper storage conveyors, and supplied automatically to the Duowrap. Alternatively, the bales can also be wrapped in paper from a roll. In this case, a Uniwrap with backstand is used instead of the Duowrap. This is a fully automatic device, which is operated pneumatically, for folding the ends of the wrapper over the bale. The wrappers are folded over the bale ends with an envelope fold. Stencilling is the new industry standard for printing information such as bale weight, pulp type, identification number, and company logo, as well as the bar code on the wrapped pulp bales. The bale stacker is of simple and reliable design. Up to six bales (wrapped or unwrapped) are combined in one stack. The ANDRITZ BaleMatic has been developed for pulp finishing systems, based on a standardized local PLC (Programmable Logic Controller) system programmed by ANDRITZ. Electrical control of the BaleMatic is handled by the fully automatic PLC system for high reliability. Local control desks, touch screens, and indicators are integrated into the PLC system. The application software is modified for each individual baling line. Sophisticated programming ensures optimum results for time-critical machine functions as well as safe and comfortable operation of the equipment. Production and system data are transmitted to a DCS or mill-wide information system via an interface. BaleMatic uses standard field bus technology. ANDRITZ uses a tool called "soft commissioning" to commission the functions of each machine based on a real-time simulation program. As a result, the PLC software comes to the fully commissioned mill. All equipment is pre-tested (function tested) at the ANDRITZ workshop before shipment. In the control system, a register structure is assigned to every conveyor for the bale numbers. If the bales are moved from one conveyor to another, or from one PLC to another, the bale numbers are “handed over” to the control commands accordingly. Operators can always assign a process value to a bale number. A PC interface program manages and transmits the data to the database. ANDRITZ also uses this tool in operator training to display the variations in movement patterns. In order to optimize production, this tool can be used to identify production bottlenecks in existing lines when rebuilds are planned, and to help implement the new equipment. For new lines, the entire baling operation can be simulated and optimized in terms of logistics and production during the engineering phase.